It may be the biggest event in UFC history and it goes down TONIGHT at Madison Square Garden with three world title matches. Eddie Alvarez defends the lightweight title against Conor McGregor, Tyron Woodley defends the welterweight title against Stephen Thompson, and Joanna Jedrzejczyk defends the strawweight title against Karolina Kowalkiewicz! It's UFC 205 and our coverage begins at 7 PM ET, 6 Central. Once the headline reads "in progress" hit F5 or refresh as often as you like for the latest updates! Earlier action this evening is as follows. * Bantamweight: Liz Carmouche d. Katlyn Chookagian by split decision of 28-29, 29-28 X2. * Catchweight (162.6): Jim Miller d. Thiago Alvez by unanimous decision of 30-27, 29-28, 30-27. * Welterweight: Vicente Lique d. Belal Muhammad by knockout at 1:19 of R1. * Middleweight: Tim Boetsch d. Rafael Natal by technical knockout at 3:22 of R1. * Lightweight: Khabib Nurmagomedov d. Michael Johnson by submission (kimura) at 2:31 of R3. Tale of the tape!! 35 to 30, 5'6" to 5'8", 145.5 to 146 and 68" to 71" reach from Edgar to Stephens. Stephens is in the white trunks, 25-12, and fights out of San Diego, California by way of Des Moines, Iowa. Black trunks for Edgar, 19-5-1, fighting out of Toms River, New Jersey. Our referee in charge is Keith Peterson. Both men size each other up cautiously at the start, shadowboxing and circling. Edgar shoots for a single leg and Stephens blocks it. Edgar spins to avoid a leg kick. He shoots again and Stephens blocks it a second time. He shoots again and grabs the neck when Stephens blocks it, lets go and gets in deep on a single leg as we pass the halfway point of the round. Stephens finally goes down at 3:04 but only for a split second. He goes down again at 3:15 and pops right back up. Edgar pops Stephens with a left hook and Stephens responds with a knee when they break. Body kick by Stephens and Edgar gets poked in the eye so the ref calls time. Edgar says he's fine but the ref makes him wait until a doctor checks him over anyway. He's cleared to go. The dance continues until the horn ends R1. Stephens takes a shot to the cup 17 seconds into R2 and we get another time. And I do mean a SHOT, Edgar aimed a punch and hit the crotch instead. Stephens is quickly ready to go again. Edgar is dancing in and out and firing shots. He lands a good right to the chin at 1:08 and goes right for takedowns, physically throwing Stephens to the ground at 1:18 on a second takedown, both times Stephens gets back up. Stephens rocks Edgar with a kick and he's wobbly even when he manages to get back to his feet, and Stephens is headhunting. Edgar is backpedaling and trying to get his legs under him with two minutes left. Stephens keeps on loading up on the right hand. Edgar takes him down at 4:02 and grabs a guillotine as Stephens tries to get back up. He can't get the submission but he's on top now doing damage and trying to get the mounted guillotine with short time left. Stephens gets out but eats some big elbows to end the round. This fight's totally up in the air. It's hard to say who won either round. You might think Stephens won R2 from the knockdown but Edgar got multiple takedowns and was really dominant in the last minute. You might think Edgar won R1 but nobody did a significant amount of damage either way. Takedown with 42 seconds gone in R3 and Edgar is looking to move up. Edgar takes the back at 1:58 with one hook in. Stephens gets up at 2:15 and is taken right back down to the same spot he was in before. Stephens starts headhunting again when he's able to get up. He stuffs a takedown at 3:18. Stephens throws out another head kick that's an inch short. Stephens' corner is calling out "body head." Edgar takes a big body shot as he dances around Stephens. He ducks as Stephens swings away then comes over the top with a right. Nobody lands the kill shot before the horn. 4 minutes left on FS1 so we'll be coming back with the decision fast! THE JUDGES SCORE IT 30-27, 30-27, 29-28 ALL FOR FRANKIE EDGAR. That's about as fast as I've ever heard Buffer read cards. On to the PPV!! Our first PPV bout! Pennington is in the white trunks and top for tonight's fight. Tate is in almost black head to toe except for a white spot where the Reebok logo is on her top. 5'6" to 5'7", 135.5 each, 65" to 67.5" reach from Tate to Pennington. Pennington is 8-6 and fights out of Colorado Springs, Colorado. Tate is 18-6 and fights out of Las Vegas, Nevada. Our referee in charge of this contest is Dan Miragliotta. With a tap of the gloves we're underway! Tate with an inside leg kick as the women circle and feel out the range. Left hook and a jab by Pennington. Another inside leg kick by Tate and another jab by Pennington. Pennington tags Tate several more times and Rogan is concerned. Tate lands a right hook and several shots to the body before dropping levels to look for a takedown. Pennington gets her back to the fence and widens her stances then grabs a front headlock and Tate has to kick off the fence several times to try and loosen the grip. She gets the single leg at 3:07 and is safe in full guard. Tate is trying to pass to the back and lets Pennington up in the process with a minute left. Pennington fires elbows at her leg as Tate clings to the back with one hook in, making Pennington carry her weight. 10-9 round for Tate thanks to her dominance in the latter half of it. Joe Rogan disagrees and says Pennington came closer to finishing in R1. That's a valid argument. It could go either way with the judges. Tate eats a straight left jab to the face, and another, and another. Tate's face is clearly turning red from all these shots landing. Pennington lands an uppercut as they clinch. Tate lands knees to the body and then starts looking for another takedown, all while grabbing a muay thai plum for knees to the head periodically. Tate's corner is yelling for head pressure. Tate gets a warning as Pennington tries to slip behind and take her back not to grab the fence. Pennington lands some good right hands as she pushes Tate into the fence. Tate grabs the clinch for knees again. Tate turns Pennington back into the cage but Pennington fires off several knees in a row. Tate fires off a big right as they break and they exchange a pound at the horn. 10-9 Pennington. Third and final round. Tate pulls guard almost immediately. Peninngton takes her down to the ground as a result and lands a few elbows but Tate is looking to lock up an arm or a triangle. Pennington is trying to hammer her way out of danger but she's constantly at risk of getting caught here. Tate tries to look for a leg but Pennington gets her down to the mat in a North-South position, and Tate tries to wall walk with the fence even as she's warned to let go of the shorts. Tate gets back up and Pennington sits her down and tries to set up a guillotine, but Tate gets the butterfly guard and goes for a leg as Pennington is warned not to grab the fence. She pops out of it with two minutes left. Pennington sprawls to avoid a transition to a takedown. Pennington pushes Tate into the fence and is grinding away with short shots late. I get the feeling Pennington is going to take this for two rounds if not all three with the judges. Pennington is on top as the time ticks away and Tate is eating more elbows and strikes at the horn. Tate's face is beet red as they get up. THE JUDGES SCORE IT 29-28, 30-27, 30-27 ALL FOR RAQUEL PENNINGTON. After Pennington's interview Tate says she's retiring following the performance because she doesn't have anything left to give. She christens Pennington the future of the division and says her era is now the past. Rogan says it's been an honor to call her fights. Romero is in the white trunks. Weidman the black. Weidman is two inches taller and has a 4.5 inch reach advantage on the Tale of the Tape. Romero is 11-1, 6 feet tall, 185.5 pounds, and he fights out of Coconut Creek, Florida by way of Cuba. Weidman is 13-1, 6'2", 186 pounds, and he fights out of Baldwin, New York. Mario Yamasaki is our ref. Here, we, go! Romero circles and keeps his hands up high. Weidman lands a body kick. Weidman paws at the range with his left hand as the squat and muscular Romero stays defensive. He finally snaps off a body kick at 1:20. Weidman teases a single leg but doesn't commit. He teases a knee but pulls it back. He's trying to keep Romero guessing constantly. A body kick misses. Weidman gets a single leg but Romero gets back up. Weidman with another body kick and a right hand. 2:30 gone, 2:30 left in R1. About five straight body kicks by Weidman and another takedown that Romero gets out of, and Weidman throws a leg kick. Weidman lands a good counter left hook as he backs up from a Romero charge. Romero tries again to charge in but Weidman slips and rips. Single leg by Weidman and he takes the back as Romero goes to get back up, riding on him against the fence at the horn. 10-9 Weidman. Weidman isn't able to get his first single leg of R2 but Romero doesn't grab any guillotine off it either. It's worth noting that Romero dumped water on himself between rounds and Yamasaki had to delay the start to towel off the wet spot. Romero's tactics to delay the start of rounds are REALLY obnoxious. Weidman takes a left hook from Romero. Weidman with a knee to the body and Romero complains that he got poked in the eye. Good grief. Yamasaki isn't buying it and restarts the fight without a doctor coming in. Weidman goes for a single leg but lets it go to throw a head kick. Romero goes for a takedown of his own and Weidman avoids the first attempt, but not the second, although he pops right back up. Romero tries to drag him back down from behind. Weidman throws reverse elbows. Romero throws knees to the thighs. Romero gets him down for one second but he's back up at 4:16 just a second later. Romero gets him again and is on his back at the end. Might be a 10-9 Romero off his work with the wrestling. Weidman opens up R3 immediately with kicks to the leg and to the body. Romero lands a flying knee and THIS FIGHT IS OVER. He jumps the fence to celebrate. BLOOD IS GUSHING FROM WEIDMAN'S SCALP. It's pretty gruesome. OFFICIAL TIME OF THE FINISH - 0:24 OF R3 FOR YOEL ROMERO BY TKO. Michael Bisping gives him a thumbs down and a middle finger up. Yoel Romero screams "I LOVE YOU! I'LL SEE YOU SOON, BOY!! YOU KNOW ME, BOY!!" Karolina is 10-0 and wears the white trunks and top as the challenger tonight. Joanna is the champ in all black, sporting an undefeated record as well, 12-0 overall. Karolina fights out of Lodz, Poland. Joanna fights out of Olsztyn, Poland. Our referee in charge is Keith Peterson. Due to the fact it's so hard to type their last names I'm just going to give post-round summaries unless there's a sudden finish. I give the first round to Joanna 10-9 due to outstriking the challenger in almost every exchange that they had. Very solid start for the reigning defending champion. Joanna's lead continues to grow as the fight goes on. She's the more dynamic striker. She punctuates her combos with kicks and moves more fluidly around the Octagon. Karolina seems perplexed trying to find the answer and she's eating leg kicks to boot that will slow her down in later rounds if it goes that far. The only thing that might hurt Joanna a little bit is a trickle of blood from her nose from the occasional jab Karolina has landed. "She's battering Karolina," said Rogan. He's right. Three rounds in the bag for Joanna. Karolina wants takedowns so badly but Joanna's balance is too good. Even when she catches a headkick in mid air she can't get Joanna to the ground. Joanna lands an elbow almost every time they break from a clinch and keeps on punishing her with one leg kick after another. KAROLINA STUNS HER IN R4. Joanna is trying to recover. 3 minutes left. Joanna goes for a takedown to try and recover. Karolina peels her off. Karolina catches a kick and goes for a takedown of her own. Joanna seems okay with a minute left. They are banging though and if Karolina caught her again it could be bad news. They both try spinning backfists. Karolina eats a leg kick so hard it makes her switch stances. Left hook and a head kick by Joanna. She might have tagged Karolina late. The two hug to open R5. Joanna's nose might be busted to hell and back. There's no quit in her though. Great punch kick combo at 1:40 from the champ. I love watching the way Joanna strings combos together. She goes body head kick head elbow so fluidly. They stand and trade at 2:35. Neither one of these women will be thrilled with how their face looks at the end of this contest. Joanna's right eye may be swelling shut but she only needs to go another 90 seconds. Joanna is up 75-4 on leg kicks landed according to the commentary. A look at Karolina's legs quickly confirms it. They clinch on the fence with a minute left and Karolina's running out of time. Elbow left hand kick and takedown defense by Joanna. She's got Karolina's back standing with short time. Big right hands and a body kick on the break. These two left their hearts in the Octagon tonight. THE JUDGES SCORE THIS 49-46 X3 ALL FOR JOANNA. She says that Polish girls are the toughest in the world and asks UFC to book her a title defense in Poland next year. "Why not?" She says she's humble and focused and works hard every day and that's why she's still the champion, and thanks UFC for bringing her to New York, and thanks New York too. Karolina says Joanna's the best in the world but she's happy she gave such a good fight and she too wants to be on a marquee card in Poland. Time for our co-main event! Thompson is in the white trunks, 13-1, 169 pounds, and fights out of Centerville, South Carolina. Woodley is in the black trunks, 16-3, 170 pounds, fighting out of St. Louis, Missouri. Our referee in charge is Dan Miragliotta. The crowd is getting impatient after over a minute has gone by without either man landing a shot, as both try to measure out the range and get a feel for the distance. Thompson finally lands one kick. Woodley catches a kick and takes Thompson down at the 2 minute mark. Wonderboy tries to scoot out to no avail and is eating hard liver shots. Woodley is landing some nice elbows from half guard too. Wonderboy gets full guard back for the last half minute but Woodley makes him pay for it by pounding on his ribs and opening up some cuts on his head. 10-9 for the champ. Woodley backed up toward the fence and lured Thompson into coming at him with strikes, and Woodley grabbed him the moment he did to control him against the cage and throw knees and punches to the body. Thompson breaks free at 2:16. Woodley tries to lure him in again with his back against the fence, then rushes with a flurry and Thompson has to backpedal quick. Thompson throws a spinning back kick that connects. Wonderboy tags him again with a minute left and Woodley eggs him on. Straight left by Thompson. Woodley bull rushes with right hooks but they don't connect. He lands a right hook as the round ends. I'd give this one 10-9 to the challenger. The long reach of Thompson appears to be paying dividends now. Woodley should look for a takedown. Joe Rogan feels the same way. 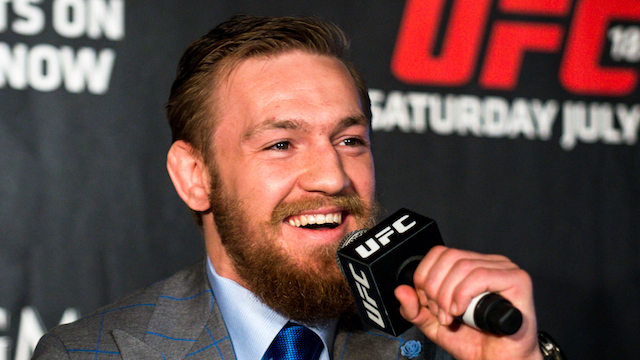 The crowd is singing an OLE chant like Conor was fighting - that's up next though. Leg kick by Woodley. Left hand by Thompson. Thompson keeps tagging Woodley. Left hook connects. Two minutes left. Wheel kick attempt by Wonderboy. Woodley gets off a 3 punch combo. Wonderboy dances side to side and Woodley throws a really hard leg kick that makes Thompson stumble. Woodley lands some good strikes in the last minute. Could be a toss-up round with the judges. Right hand by Thompson lands at 0:55. Woodley rocks him at 1:25 and blood is flowing from Thompson's nose. He's circling away and gets caught with ANOTHER RIGHT HAND. Woodley is trying to pound it out and the ref is taking a close look. Wonderboy is getting DESTROYED WITH KNEES. Woodley locks up a guillotine choke and somehow he's surviving it! Woodley pulls him to the ground and squeezes for all he's worth but he pops his head out with a minute left! Wonderboy is not able to do enough damage in the last round to steal it back though. I still give it it Woodley. Both men exchange a double high five to open out final round. Woodley tries a jumping round kick. Woodley covers up for a combo. Leg kick for Thompson. Woodley has his back to the fence. Wonderboy throws the head kick. Woodley shakes his head. Leg kicks by Woodley. Jab by Thompson. Half of R5 is gone. Jabs by Thompson. Right hand by Wonderboy. Combo by the same. Body kick by Woodley. Leg kick Thompson. Right hand Woodley. Body shot by Wonderboy. Right hook by Woodley. Jab by Thompson. Woodley rushes but doesn't land it flush. Thompson continues to jab. Time is ticking down. Right hook by Thompson. This one's going to the judges!! THE JUDGES SCORE IT 47-47 DRAW, 47-47 DRAW, 48-47, SPLIT DECISION FOR WOODLEY. Huh??? Shouldn't that be a majority draw? I'm a little perplexed. I'm not sure if I heard that right. Okay Buffer comes back in and Joe Rogan explains that you retain the title because it's a MAJORITY DRAW and he only won one out of three cards, but in a draw the champ still retains the title. What an incredible clusterf#@$. Featherweight champion McGregor is out first, wearing white trunks, challenging for the lightweight title of Alvarez tonight. His entrance was "I Get Money" by 50 Cent. Alvarez comes out to "Victory" by Puff Daddy f/ Busta Rhymes & Notorious B.I.G. He has on the black trunks. Our referee in charge is John McCarthy. McGregor is 20-3, 5'9", 154.5 pounds, fighting out of Dublin, Ireland. Alvarez is 28-4, 5'9", 154.5 pounds, fighting out of Philadelphia, Pennsylvania. Here, we, GO. Alvarez lands the first leg kick. He also lands an inside leg kick. McGregor is measuring the range and looking for the money shot. Front kick to the body from McGregor. The crowd is singing OLE again. Alvarez is moving side to side and gets cracked with a left but he pops back up. Alvarez throws a head kick as McGregor measures the range again. McGregor avoids a clinch attempt. McGregor lands another one and Alvarez is stung. A third one lands as we pass 2:15. Alvarez tries to scramble but McGregor is on top dropping bombs. Alvarez finally gets back to his feet with 2 minutes left in R1. Alvarez tries to shoot and he eats a knee and a right elbow. Another left hook connects. Front kick by McGregor. Counter left by McGregor. Left at 4:18. Body shot by Alvarez. Head kick attempt by Alvarez. Body shot. Alvarez survives R1 but that's borderline 10-8 for McGregor off the repeated knockdowns. McGregor cracks him with the left hand again 30 seconds into R2. McGregor stuffs a takedown attempt and lands a left elbow. McGregor is starting to taunt Alvarez now with his hands behind his back. Alvarez tries to swarm in and does land a right but gets hurt by another left and has to dig for a takedown to save himself. Alvarez can't get him down and has to just resort to trying to get rights off in the clinch. McGregor gets knees off to the body. They break and we've got just over 2 minutes left in R2. ALVAREZ GETS ROCKED AND THIS TIME HE CAN'T DEFEND HIMSELF AND MCGREGOR HAS ACHIEVED HIS GOAL OF BECOMING A TWO WEIGHT CLASS CHAMP. If you want to see a thing of beauty watch the finishing sequence of strikes that wobbled Alvarez and left him defenseless. Alvarez was flopping around on the ground and not putting his hands up to stop anything. CONOR MCGREGOR WINS THE LIGHTWEIGHT TITLE AT 3:04 OF THE SECOND ROUND. Joe Rogan reminds us again that for the first time ever we have a two weight class champ. "Where the f#$@ is my second belt? I've already got this one. They're not on my level. Eddie's a great fighter but he shouldn't have been in here with me." Joe Rogan asks him what's next? "Thanks everyone for coming out. I f#@%ing love everyone. I appreciate every single one of you. What's next for me Joe? I'm gonna get that second belt. Where the f#%@ is it at? I've spent a lot of time Joe slaying everybody in the company. Backstage I'm starting fights with everybody. I'd like to take this chance... to apologize to nobody! The double champ does what the f#@$ he wants." They bring him his second belt and he snatches it from Dana White. "That looks good Dublin!!" He jumps on the Octagon and sits there with both belts celebrating. Good night everyone!